Slate Digital has released its long-awaited Virtual Microphone System. As a reminder, you only have until the end of the year to order Joachim Garraud's Producer Pack bundle. French artist Joachim Garraud presents the Producer Box, a limited edition pack announced as "a new Concept of sharing music, tools, and knowledge". Slate Digital has announced its long-awaited Virtual Microphone System is finally complete. 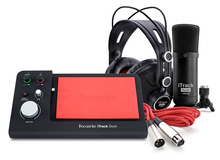 Focusrite unveils two new hardware and software bundles built around RedNet 1 or 2 interfaces, with an Ethernet switch offered for a limited time. IK Multimedia helps you list your Xmas gifts with three new special priced bundles and a 50% discount off its iOS apps. We know Sound Magic for their virtual instruments and effect processors, but were did not expect them on the DAW and hardware audio market.